^ Froese, Rainer, and Daniel Pauly, eds. (2014). 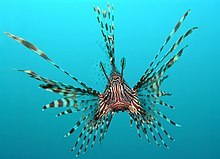 Species of Pterois in FishBase. 2014年6月版本. ^ Morris, J. a, & Akins, J. L. (2009). Feeding ecology of invasive lionfish (Pterois volitans) in the Bahamian archipelago. Environmental Biology of Fishes, 86(3), 389–398. doi:10.1007/s10641-009-9538-8. ^ Randall JE, Allen GR, Steene RC (1997) Fishes of the Great Barrier Reef and Coral Sea. University of Hawaii Press, Honolulu. ^ 5.0 5.1 5.2 Morris, J. a, & Freshwater, D. W. (2007). Phenotypic variation of lionfish supraocular tentacles. Environmental Biology of Fishes, 83(2), 237–241. doi:10.1007/s10641-007-9326-2. ^ Church, J. E., & Hodgson, W. C. (2002). Adrenergic and cholinergic activity contributes to the cardiovascular effects of lionfish (Pterois volitans) venom. Toxicon, 40, 787–796.